Gone are the days when an overwhelming navigation bar and bright hued scrolling marquees used to represent a company’s web page. As time and technology has inched forward, the domain of web development has grown heaps and bounds ushering a breath of fresh air to an ever-wider audience. With the advent of smartphones and cloud storage, web development has evolved from conventional coding methods to enhance user interaction and experience for ascribing an edge in a competitive world. Depending on diverse business niches, there are scores of web development solution providers in the market today. However navigating through the complex world of web business is no easy feat. To help organizations select the best vendors that offer the most promising solutions, a distinguished panel of prominent CEOs, CIOs, VCs, and analysts, along with the CIOReview’s editorial board has assessed hundreds of technology solution providers and shortlisted the ones that are at the forefront of providing cutting-edge technology. 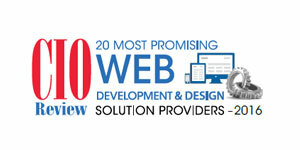 We present to you 20 Most Promising Web Development & Design Solution Providers 2016.